Transcending history and the world, a tale of souls and swords eternally retold ... now via iPad and iPhone. 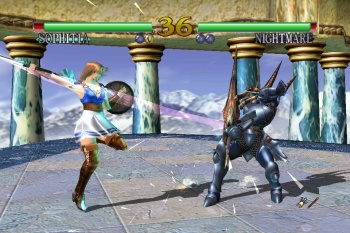 Namco Bandai has announced the release date for its iOS port of the popular Dreamcast fighting game, Soul Calibur. The game will be available for download from the App Store beginning Thursday, January 19th for anyone in possession of iPhone 4/4S , iPod Touch 4 or iPad 2. Soul Calibur will feature a cast of all nineteen original fighters, and six game modes: Arcade Battle, Time Attack, Survival, Extra Survival, Practice, and Museum. As you may have noticed, there's no mention of any form of multiplayer, however the Time Attack, Survival and Extra Survival modes will be integrated with Game Center's online leaderboards. While the idea of wailing on Siegfried's smug, polygonal face on the go sounds enticing, I just can't imagine trying to pull off Ivy's Insanity Feast from those teeny virtual buttons. Still, if you have much nimbler fingers than I, the good news is that you won't have to wait very long to try it out. But, if your pudgy fingers are like mine, maybe just wait a few weeks more and pick up Soul Calibur V for either Xbox 360 or PS3 when it hits shelves on February 3rd.